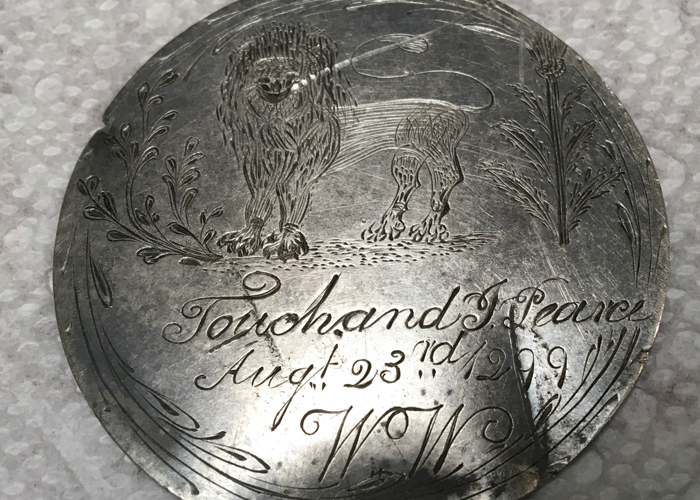 Recently I found what appeared to be the lid of a can with my Garrett AT Pro. Buried in a clod of baked muck I noticed a bail attached to it. 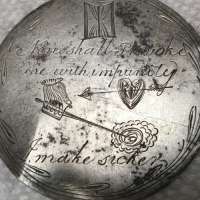 I’ve learned not to discard anything without examination so I brushed away the dirt and when I saw engraving I knew I had something. 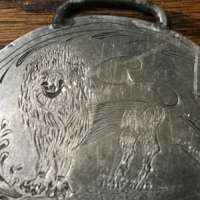 It took an hour to gently scrub away the grime and I used the trick of aluminum foil, baking soda, salt and boiling water to remove the tarnish. It required 6 baths to accomplish that. 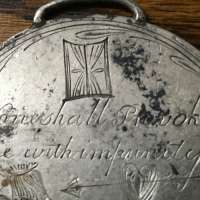 What I have is a thin flat silver disc about 2 inches across. 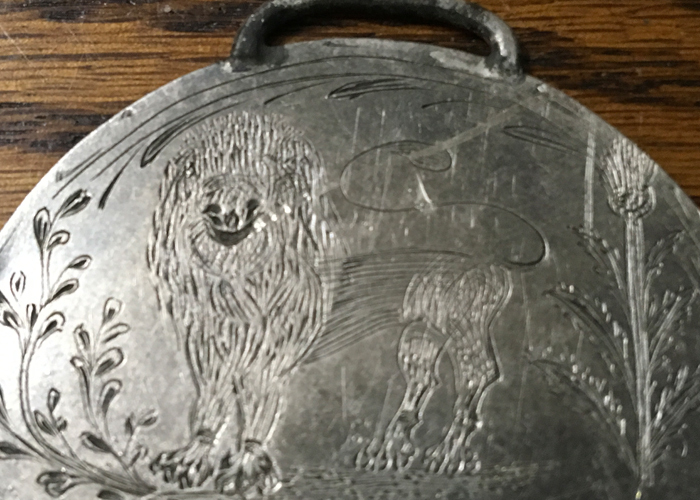 It is heavily engraved with Scottish iconic symbols. There is a lion, thistle, heather, an hourglass, an arrow through a heart and a hand holding a sword stabbing a rose. ( I learned that signifies “ striking at England “ symbolized by a rose). (This actually looks like a metal detector!) There is the Scottish National Motto, NONE SHALL PROVOKE ME WITH IMPUNITY. 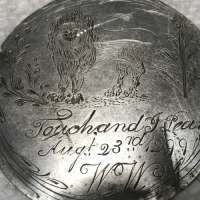 There is the date August 23, 1299 and the initials WW below. I cannot find any significance to that date BUT August 23, 1305 is the date William Wallace (BRAVEHEART) was brutally executed in London. Now is when it gets shocking. 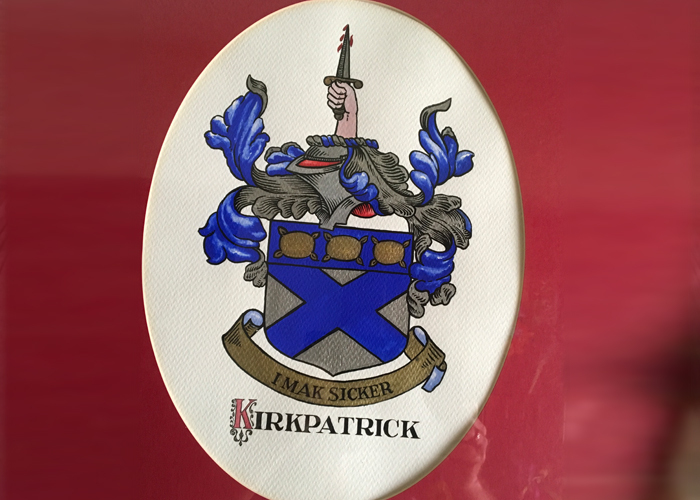 I immediately recognized the slogan I MAK SICKER (Siccar) because it is on the Kirkpatrick Family Crest. This slogan was bestowed to us by Robert the Bruce in 1306. If you saw BRAVEHEART, you know Bruce became the first king of Scotland but his path to the throne was unsettling. He had an opponent, John “Red” Comyn who was favored by most noblemen. Bruce proposed they meet in the church at Dumfries. Traditionally a church was a safe sanctuary. However Bruce pulled a dagger and stabbed Comyn and fled. 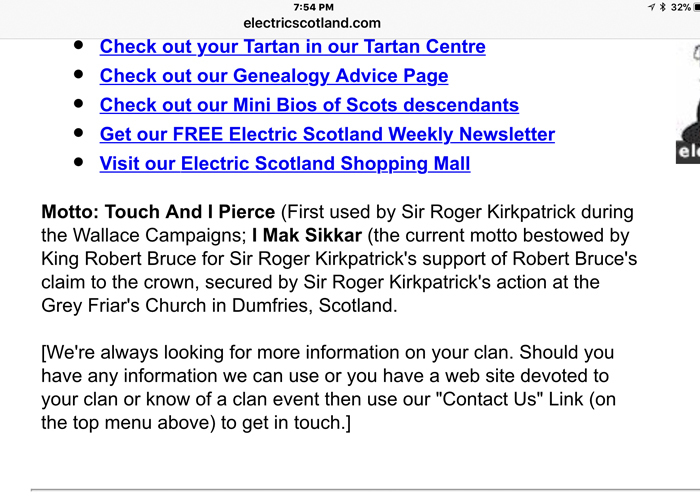 Outside was Bruce’s best friend and third cousin, Sir Roger Kirkpatrick ( also Wallace’s first cousin). When told what happened he asked if Comyn was dead and Bruce said he didn’t know. 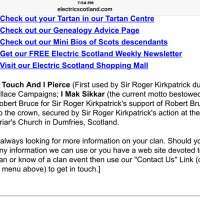 Kirkpatrick then pulled his dagger and said I MAK SICCAR ( I’ll Make Sure) and returned and finished Comyn. The pair fled from the authorities for 3 days. There are 3 pillows on the Family Crest reflecting 3 nights they slept in the woods. All historical fact and can be easily authenticated. Google it. So this was shocking to see on this disc. 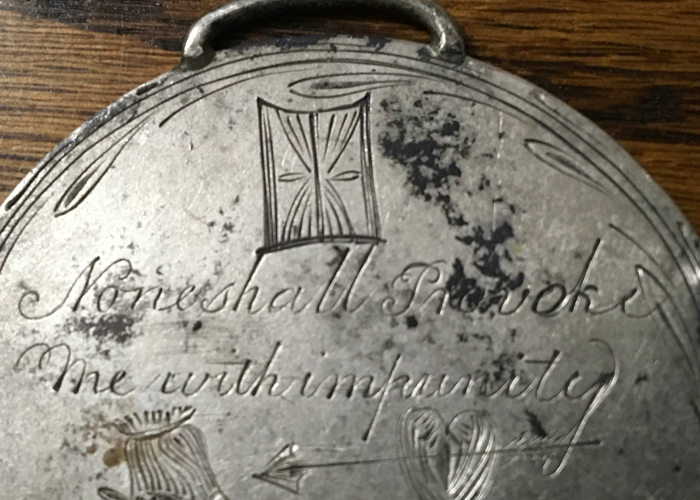 But nothing like the last engraving. We saw the name TOUCHAND I PEARCE and we googled every variation possible. Nothing. Then we were informed we were reading it wrong. It’s actually TOUCH AND I PEARCE (Pierce). Touch and I Stab. Kind of a Gaelic Don’t Tread On Me. 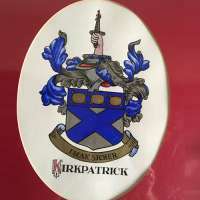 I did not know this but that was the Kirkpatrick family motto before the Comyn incident. So there are two references to my ancestors. When Georgia was a new colony, Oglethorpe who was governor, recruited many Scots to emigrate to Southeast Georgia to act as a buffer against the Spanish in St Augustine. 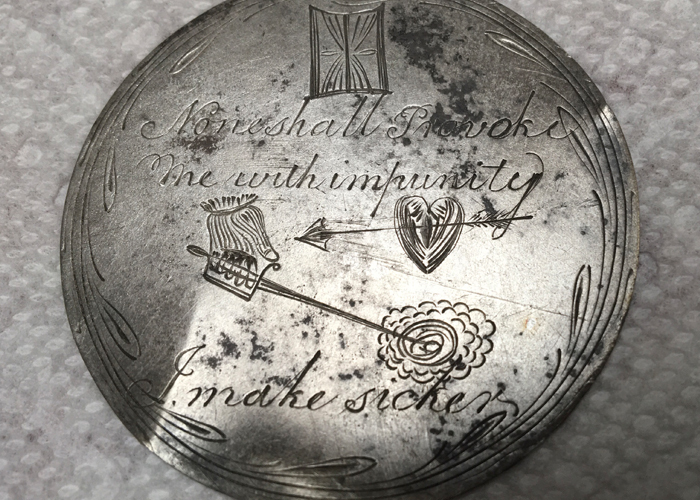 I recently found a 1775 Spanish 1 Reale near where I found this mystery. My theory is one of my ancestors was one of them. There is a thin indention as if it was struck by a sharp edged item, possible a knife, sword or pike which might have caused it to be lost. Now what is it? I have sent pictures to the major Scottish museums, universities and numerous historians as well as the Smithsonian, UF, FSU, JU, UNF and others. Nobody so far knows but all are mystified, curious and intrigued. The general consensus is it’s probably 1740s or earlier. It’s a one of a kind prize so I will probably never know. But it’s a keeper!